Many of the cities that Mahmud destroyed never recovered their original glory, but they continue to exist. Each of these cities – Mathura, Thanesar, Bhimnagar, Kannuaj, Baran (Bulandshahr), Munj, Asni, Saharanpur – deserves a fitting memorial to the Hindu victims of genocide that took place a millennium. 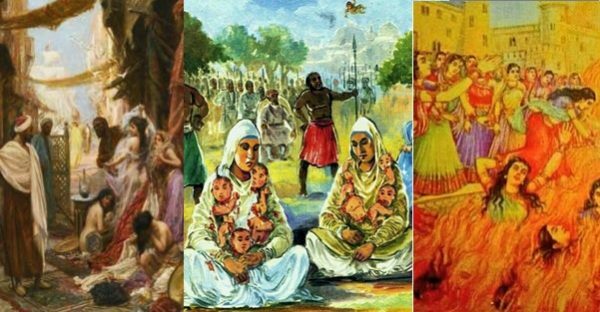 xactly one thousand years ago the ancient city of Mathura was attacked by Mahmud, the ruler of Ghazni, who brought death and destruction of apocalyptic proportions to the beautiful birthplace of Lord Krishna. On December 2, 1018, advancing further into India than any Muslim ruler prior, Mahmud descended upon the fort of Mahaban on the outskirts of the city. Kulchand, the king of Mathura, opposed the massive horde – comprising mainly Turks and Arabs – and fought bravely alongside his small but powerful army. Swords and spears were used in savage hand to hand combat. After hours of bitter fighting, the more experienced forces of Mahmud overcame the fort’s defenders. The soldiers and citizens abandoned the fort and tried to cross the foaming river which flowed on the other side of the fort, thinking they would be able to put up better resistance from the opposite bank. But Mahmud’s forces pounced upon them; between 5,000 (1) and 50,000 Hindus (2) were killed, drowned or became the prey of crocodiles. Seeing his position was hopeless, Kulchand took out his dagger, killed his young son, slew his wife and then drove it into his own body. The Muslim army obtained 185 war elephants plus other booty. This wasn’t Mahmud’s first attack on India; since 1001 he had been pillaging the country, especially eastern Afghanistan (still a Hindu province of India) and Punjab, on an average every 18 months, killing tens of thousands and taking away hundreds of thousands of Hindu men, women and children as slaves. And yet the fragmented Indian kingdoms never prepared for the inevitability that pillaging Muslim armies could penetrate further into the country’s heartland. With their king dead, and knowing a great pestilence was coming in the form of Mahmud, the defenceless citizens of Mathura fled their beloved city. (3) On the morning of December 3, 1018, the rapacious horde, hungry for loot and slaves, poured into Mathura. Some were battle hardened and disciplined troops; most were unpaid freelancers whom Mahmud had promised a sizeable war booty plus as many beautiful Hindu maidens and child slaves they could get their hands on. When Mahmud entered Mathura, he saw a building of exquisite structure, which the inhabitants said had been built, not by men, but by heavenly beings. The wall of the city was constructed of hard stone, and two gates opened upon the river flowing under the city, which were erected upon strong and lofty foundations, to protect them against the floods of the river and rains. (2) On both sides of the city there were a thousand castles, to which idol temples were attached, all strengthened from top to bottom by rivets of iron, and all made of masonry work ; and opposite to them were other buildings, supported on broad wooden pillars, to give them strength. Among the idols there were five made of gold, each 15 feet tall, fixed in the air without support. In the eyes of one of these idols there were two rubies, of such value, that if any one were to sell such as are like them, he would obtain 50,000 dinars.